Mad Cave Studios have given us some amazing books: from a holy war to sci-fi epic, we have seen some incredible ideas from the studio. With Honor and Curse, we are transported to 14th Century Japan as we see a man struggling with something deep inside himself. By Mark London, Nicolas Salamanca, with colors and cover by Tekino, and letters by Miguel Angel Zapata, the book opens with Genshi running from an angry mob out to kill him. We see something is inside him, talking to him as he seemingly takes his own life, or does he? Rewind nine years and Genshi is training to become a shinobi, haunted by nightmares and possessing something out of the ordinary. An orphan found and taught in the ways of the Shinobi, Genshi has something dark and menacing lurking inside, waiting to come out. But once Genshi masters his training and becomes the lead Shinobi, the leader of the Iga clan drops a bombshell, ordering the death of Genshi before the war hits. Genshi’s life is full of mystery and secrecy, from his forbidden relationship with Akemi to the monster inside, Genshi is a character with layers to discover. The book looks and feels terrific. The story flows nicely, as we want to see what exactly is inside Genshi and if he can conquer it, or control it. London’s story is fantastic and set in my favorite period. Salamanca’s artwork is vibrant to behold, full of impact and action. The designs of the characters look amazing, and with a cliffhanger like that, I cannot wait to jump into the second issue. The first print already sold out of this issue, I couldn’t even find one, as I checked it out digitally. 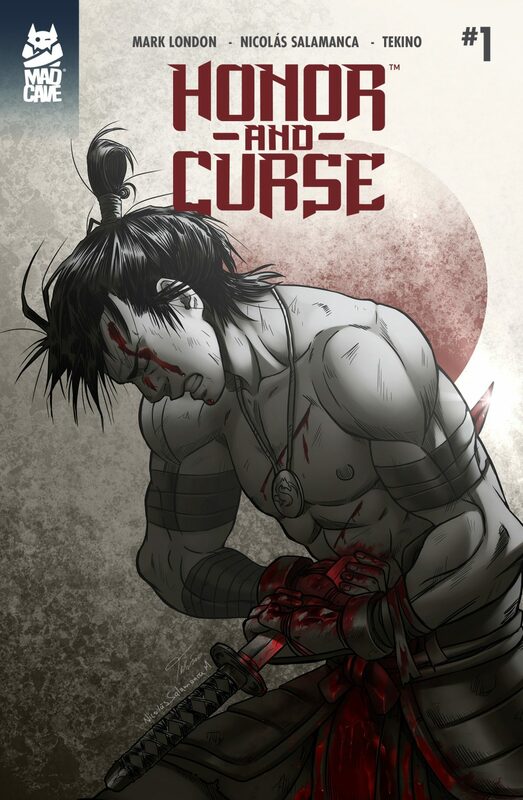 Honor and Curse is a Japanese epic in the making and another excellent start for Mad Cave.